A few weeks ago, I found myself in Austin and happened upon one of these flea market-type warehouses. It's like a ginormous, impersonal yard sale: People come with their stuff, set it up in their little station, put a price tag on everything, and hope it eventually sells. As it turns out, one of these dealers had an area that was filled with sports memorabilia, unopened packs of cards, pins and programs, all sorts of cool crap. Before long, I made the ultimate discovery. 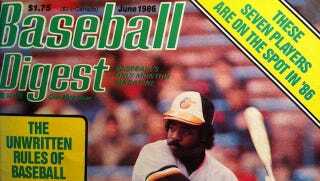 Somehow, after living the shadows for 26 years, I unearthed a long-lost copy of Baseball Digest, June 1986 issue. Right there on the cover: THE UNWRITTEN RULES OF BASEBALL. Surely this was a hoax, was all I could think. But it most definitely was real, and they sold it to me for just $1.50 (a whole quarter off the $1.75 cover price). All gems, let me tell you. The must-read, however, is on the 30 unwritten rules, conveniently presented in written form and reprinted here for all posterity. 3. Don't hit and run with an 0-2 count. 4. Don't play the infield in early in the game. 6. Never steal when you're two or more runs down. 7. Don't steal when you're well ahead. 8. Don't steal third with two outs. 9. Don't bunt for a hit when you need a sacrifice. Great! Now that we know all of that, everyone get out there and win some baseball games.